Australia's Gardner captures 12th in controversial Moto2 affair. 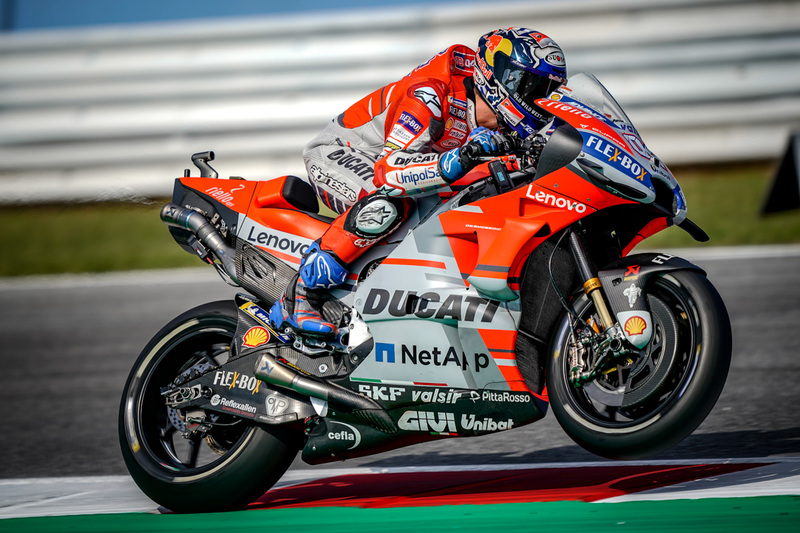 Andrea Dovizioso (Ducati Team) took an expertly-crafted victory at Misano grand prix, picking his way into the lead and unleashing incredible pace to secure only the second ever win for Ducati at the venue. 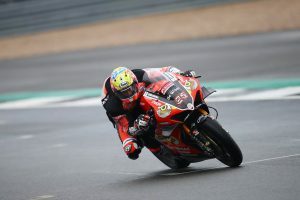 His win also makes it three in a row for the Borgo Panigale factory, having won at Brno and teammate Jorge Lorenzo following that up with victory in Austria. Lorenzo was the man on the chase at Misano, too, but there was late drama as the five-time world champion slid out on the penultimate lap after duelling Marc Marquez (Repsol Honda Team). Marquez took second at the flag, with Cal Crutchlow (LCR Honda) putting in an impressive ride to take third and come home as top Independent Team rider. It was polesitter Lorenzo who shot out ahead and got the holeshot – as the number 99 is oft to do – but Jack Miller (Alma Pramac Racing) kept second from second on the grid as the Aussie got a good start. Marquez was the biggest winner off the line, moving up from fifth after a crash in qualifying to slot into third, but he wasn’t there long. Dovizioso struck quickly against the reigning Champion before picking off Miller, pushing hard to tag on to the back of his teammate as Marquez then sliced past the Aussie too – intent on keeping tabs on the Ducati duo at the front. Unfortunately, disaster struck a lap later for Miller as he slid out at turn 14. Back at the front, ‘DesmoDovi’ was honing in on Lorenzo and looking to make a move. With 22 laps to go the Italian did just that, slicing past at turn seven. He then began to pull away as Marquez tagged on to Lorenzo in the battle for second, before the number 93 then shot past with 14 to go as the number 99 headed a little wide. The gap? 1.4 seconds to the Ducati ahead. Marquez, however, wasn’t able to cut down the gap – and a number of laps later, he was under attack. Lorenzo made it through at turn eight and lit the touch paper on a few spectacular exchanges between the two, but to no avail and he settled back into third to prepare another attack. Trying again a lap later but not making it through, the ‘Spartan’ then switched tactics and went for it at turn 12. He’d prepared the move with a couple of feints beforehand, but this time he made it stick. From there it was time to put the hammer down and Lorenzo set about cutting the gap to his teammate. Tenth by tenth, the Spaniard was reeling him in – and the gap went back down to 1.3 seconds. Dovizioso began to respond, but drama suddenly hit the front on the penultimate lap. Pushing and pushing, Lorenzo suddenly slid out of second. That left ‘DesmoDovi’ in free air at the front to take his first ever win at the venue, having managed the race to perfection. Marquez took second and extended his Championship lead, with Crutchlow’s impressive pace and race rewarded by a podium after the late drama. Crutchlow had pulled free of a squabble and sliced past Alex Rins (Team Suzuki Ecstar) to get into the position to try and close in on the then-leading trio, and more than made amends for a late crash in qualifying. 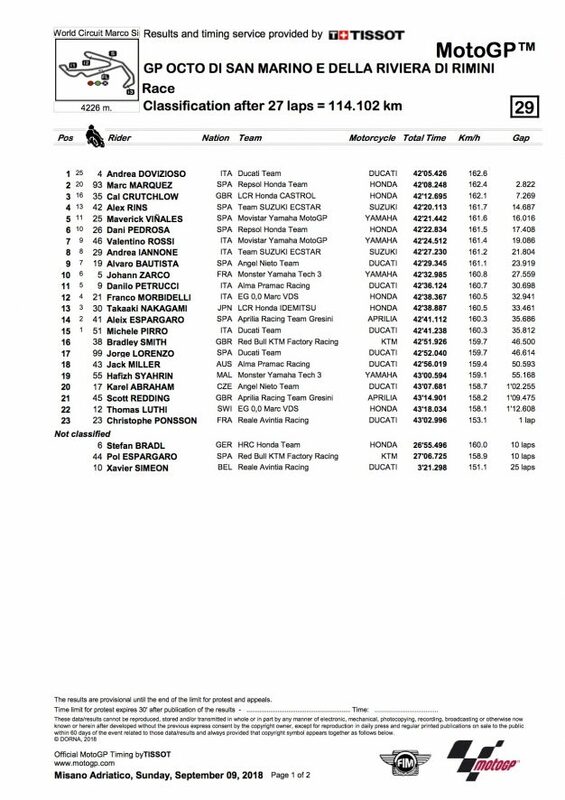 Rins, meanwhile, impressed on the softer compound rear tyre to get well in the initial fight and then hold great pace to the flag, not able to stay ahead of Crutchlow but nevertheless holding station in the top five until Lorenzo’s late crash saw him take fourth. Maverick Viñales (Movistar Yamaha MotoGP) took fifth after dropping back slightly from a front row start and suffering a more difficult race, holding off some steady pressure from Dani Pedrosa (Repsol Honda Team), who took sixth. For Valentino Rossi (Movistar Yamaha MotoGP), it was a difficult Sunday at home. 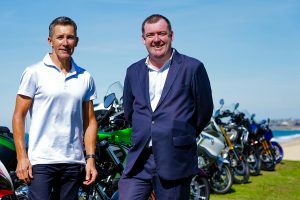 Missing the race through injury last season – as his special edition ‘Back to Misano’ helmet attests – the ‘Doctor’ had higher hopes for the race that takes place so close to his home town of Tavullia. He took P7, retaining his qualifying position by the flag. Compatriot Andrea Iannone (Team Suzuki Ecstar) also had a tough weekend, and came home eighth. Alvaro Bautista (Angel Nieto Team) continued his good run of recent form and took P9, with Johann Zarco (Monster Yamaha Tech 3) completing the top 10 ahead of Danilo Petrucci (Alma Pramac Racing). Petrucci had a difficult race day and was also given a 1.1 second penalty for cutting a corner early on. 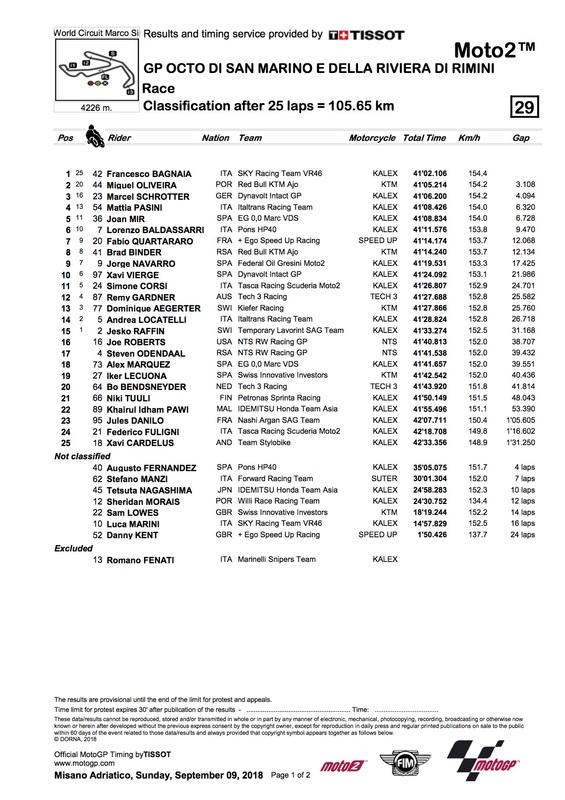 Franco Morbidelli (EG 0,0 Marc VDS) beat Takaaki Nakagami (LCR Honda Idemitsu) to the honour of top rookie and P12, with Aleix Espargaro (Aprilia Racing Team Gresini) taking points for Noale factory Aprilia on home turf in P14, just ahead of Ducati Test Team wildcard Michele Pirro. Behind them? Lorenzo had remounted and duelled Bradley Smith (Red Bull KTM Factory Racing) to the line, but the Brit was just able to stay ahead by a tenth. Francesco Bagnaia (Sky Racing Team VR46) converted pole position into his sixth Moto2 win of the season at San Marino to extend his Championship lead over Miguel Oliveira (Red Bull KTM Ajo) to eight points, with the Portuguese rider fending off Marcel Schrötter (Dynavolt Intact GP) on the final lap as the German secured his maiden grand prix podium in third. The top five was rounded out by Mattia Pasini (Italtrans Racing Team) and Joan Mir (EG 0,0 Marc VDS), while Australian Remy Gardner (Tech 3 Racing) wound up in an impressive 12th position. Romano Fenati (Marinelli Snipers Team) was shown the Black Flag for irresponsible riding in an incident with Stefano Manzi (Forward Racing Team). Following a later hearing, Fenati was subsequently suspended from the next two races. Manzi, meanwhile, was also penalised for irresponsible riding but in an earlier incident with Fenati at turn four. Manzi has a six-place grid penalty for his next event. 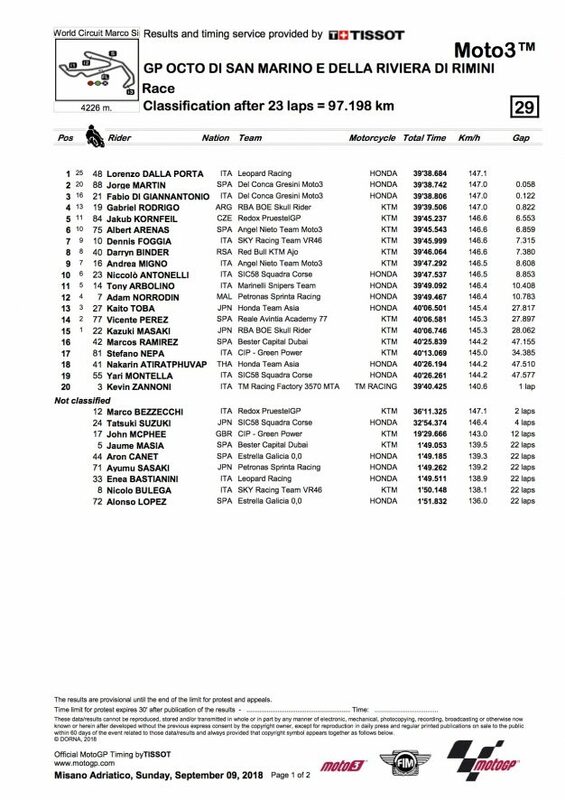 In a drama-filled Moto3 race, Lorenzo Dalla Porta (Leopard Racing) secured a phenomenal debut Grand Prix victory, beating the two Del Conca Gresini Moto3 machines of Jorge Martin and Fabio Di Giannantonio on the run to the line. They completed the podium as the championship got another shake up when Marco Bezzecchi (Redox PrüstelGP) surrendered his lead, crashing on the penultimate lap. Fourth and fifth were credited to Gabriel Rodrigo (RBA BOE Skull Rider) and Jakub Kornfeil (Redox PrustelGP). The MotoGP World Championship will now head to Aragon in Spain for round 14 of the series on 23 September.